Can you trust Google translate? Ehh..
Dunno, maybe it’s a new kind of spam. Or another quick and dirty SEO trick. 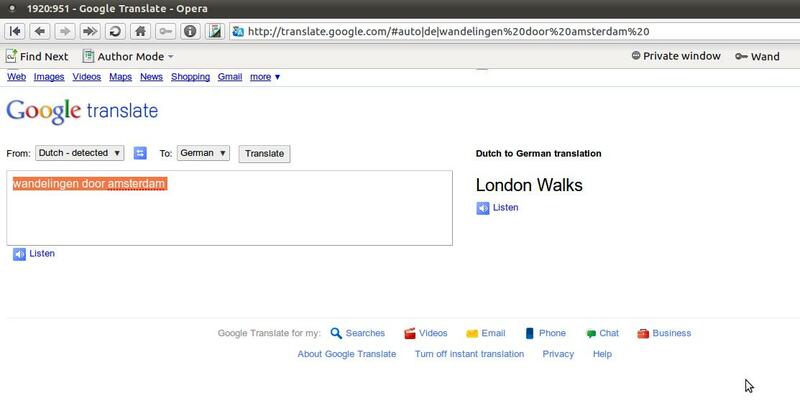 A `wandeling door amsterdam` in Dutch (`a walk in amsterdam`) is translated by Google to `London Walks` in German. Most SEO (Search Engine Optimization) experts claim they can offer services to any webmaster by helping pushing more traffic to their websites. Not necessarily the PageRank, which is an importance ranking of Google, but the position in Google result pages will be the goal most people are targeting. Inbound links help, but most traffic to ordinary sites will come from search engine result pages. Even my aunt simply types everything in Google, including URL’s. For Opera users just save this file in the User CSS directory, normally in the profile/css/user path. The you can simply select it in the dropdown menu. To install it: drag the bookmarklet to your Bookmarks Toolbar, Links Bar or Personal Bar or whatever it’s called. Use: push the button on a Google or Yahoo result page.